Not long ago, the apparently unlimited potential for companies in the education business seemed fairy-tale perfect. But, like many stories of that genre, this one has its dark moments. Perhaps the most alarming is the arrest of Everonn Education's Managing Director, P. Kishore, in September, on charges of tax evasion. That incident may be an aberration, but the road is turning out to be rockier than the industry had anticipated. Business related to schools - from kindergarten to grade 12, or K-12 - focuses on selling technology loaded with curriculum-related content aimed at making classrooms more effective. This model, pioneered in India by Educomp Solutions, has evolved from supplying computers to schools to installing interactive whiteboards which display content while allowing teachers to write on the screen with a stylus. Some whiteboards even let teachers gauge the effectiveness of a session. "Each child has a remote and can click on options to questions, which shows the level of understanding of the subject," says Abhinav Dhar, Director, K-12 Business and Operations, Educomp. Schools use technology because it brings subjects alive. "We can show how a heart beats or how a foetus grows," says Manju Arif, Principal, DPS Bangalore North, an Educomp client. Vaidehi Krishnan, Principal, GRT Mahalakshmi Vidyalaya, Chennai, adds that technology helps children gain exposure to the views of experts, and to content beyond the curriculum, such as EncyclopÃ¦dia Britannica. "It adds value to what teachers do, and helps when they go on leave." Some educators are more measured in their enthusiasm. Aditi Misra, Principal, DPS Gurgaon, says: "We see only a marginal difference with technology. A lot depends on teaching quality." Although the industry has evolved, some analysts say Educomp's success may have caused a market bubble. The amount of technology a company can install in classrooms depends on market depth in terms of school fees. There may not be enough room for companies to maintain their growth rate. For instance, a survey conducted in late 2010 by The Parthenon Group, an advisory firm, which reached out to "every private school" in the country with an email address or phone number, found the market lacked depth for companies to sustain current margins and a growth rate of 25 per cent over even the next three years. According to Parthenon, there are approximately 8,000 students enrolled in schools that charge tuition fees of more than Rs 4.5 lakh a year. "If we consider schools that charge above Rs 25,000 a year, there are still only 1,000 schools," says Ashwin Assomull, Senior Principal, The Parthenon Group. Having misjudged market depth, then, education technology companies are struggling to meet growth targets, and cutting prices in order to keep growing. "Research shows that pricing for smart classroom products is declining at seven per cent a year," says Assomull. "We reach 4.5 million students through 7,202 schools. 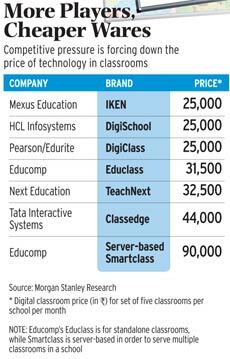 Early this year, we increased our sales force from 400 to 580 people"
A report released on October 13 by Morgan Stanley Research, too, says prices are falling, with at least six vendors besides Everonn and NIIT, some selling products for as little as Rs 5,000 per classroom per month. The research firm has lowered its growth forecast for Educomp, whose Educlass brand is priced significantly lower than its older Smartclass brand. The report also notes that Tata Interactive Systems' Classedge product, launched in January 2011 at Rs 55,000 a month for three classrooms, now goes for Rs 35,000. Brokerage and advisory firm CLSA noted in an August 2010 report that mere entry into classrooms with technological aids cannot ensure growth; the number of new schools must also increase. Reaching out to schools in small towns adds to costs. According to the Parthenon report, the larger companies had plans to open 20 to 30 premium schools a year each, but none has been able to open more than seven a year. Even if a company could start more than one school a month while maintaining quality and capital-efficiency, the market would be unable to absorb large numbers of high-priced schools. Despite all this, new companies have joined the fray while existing ones have planned expansion. For instance, HCL Infosystems, a veteran in the education industry, says it has already signed up 3,500 classrooms for its interactive whiteboards. It launched them in January 2011 under its DigiSchool Solutions brand. There are a little over a million schools in the country, and 230 million school-going children. Private schools account for just seven per cent of total school capacity, but 40 per cent of students are enrolled in them. So, besides catering to private schools, companies seek to enter public-private partnerships via government programmes such as Sarva Shiksha Abhiyan. It is clear that there is demand. "In areas where Educomp has no content, our teachers have developed interactive content in Kannada," says Arif of DPS Bangalore North. CARE Research, a division of credit rating agency CARE Ratings, estimates that the market size for classroom technology will grow from $450 million in 2010/11 to $1 billion in 2014/15 - a compound annual growth rate of 20.4 per cent - while the number of schools will increase from 1.4 million to 1.6 million. HCL Infosystems is not worried about pressure on margins. "Our brand and credibility are the most important aspects for teachers who use our content," says Anand Ekambaram, Vice President and Business Head of HCL Learning, the company's education and training division. Thanks to the new venture, HCL Learning's revenues more than doubled year-on-year for the quarter ending June 2011, and 160 per cent yearon-year for the year ended June 2011. The Dubai-based Varkey Group's acquisition of a 12 per cent stake in the beleaguered Everonn suggests that it, too, smells opportunities for growth in India, although analysts have reservations about the deal. The Varkey Group, one of the major players in the business, owns and operates schools in India through its GEMS Education division. NIIT, one of the oldest education companies, is looking at organic and inorganic growth, says Hemant Sethi, President, School Learning Solutions and HiWEL, NIIT (HiWEL, or Hole-inthe-Wall Education Ltd, is a subsidiary of NIIT). The company's plans include cloud-based solutions, digital libraries and smart identification systems for schools. As part of its strategy for 2011/12, Educomp has designed new hardware for Smartclass, besides investing heavily in content. Given that school syllabi are standard, content is not a differentiator in the this business, because it is replicable, notes a n a l y s t N i m i s h Joshi, coauthor of a May 2011 CLSA report titled New Directions in Smartclass. However, the report says that Educomp's refreshed content suite - which includes animations, assessments, question banks, and covers the curricula of all education boards in India - is harder to replicate, and aimed at "moving ahead of peers, who have focused on animation". This could help Educomp attract more schools as customers, at a time when competition has become more intense. Educomp has substantial brand recall, and reaches some 4.5 million students through 7,202 schools. Early this year, it increased its sales force from 400 to 580 people, says Dhar. "They will reach out to 500 districts across the country. We also hope to beef up our branding efforts." "We are banking on our ability to service schools and come up with tailor-made solutions for them," says Rohit Pande, CEO of Classteacher Learning Systems, a company that has been in the education business for over a decade. "This market is no longer about sales, where players could have sold things to schools based on hype." The reality is that the education business is growing - but it faces big challenges.